Not For Sale was a show FICTILIS organized in July 2011 featuring work that was, for a variety of reasons, not for sale. Literally. The show was a smashing success – nothing sold. Work with no price tag. Work you promised for a friend. Work so good, so bad, or so personal, you decided to keep it for yourself. Private work, public work. Work that belongs to you, to someone else, to everyone or no one. Found work. Work that you are contractually prevented or unofficially discouraged from exhibiting because of your relationship with a specific gallery or institution. Non-serious work, tangential work. Prototypes. Mistakes. Damaged goods. Old and dusty work. Or new and unproven work. Pseudonymous experiments. Work that doesn’t belong anywhere, or belongs in only one place. Work that happens once and then is gone. Undocumented, or undocumentable work. Site-specific or time-based, installation or performance work. Work that’s physically, conceptually, or legally impossible to buy. Sets of directions. Imaginary scenarios. Work that approaches, asymptotically, the fantasy of extra-market existence, that suggests alternative economies, performs or accomplishes its own disappearance, work that challenges or is challenged, or attempts to avoid recuperation and fails – beautifully. “Not For Sale” remains for us an ongoing curatorial intiative. The phrase is a convenient embodiment of some critical discourses the Art World tends to have about its relations with the rest of the (capitalist) world, and we deploy it as a means to enter into those discourses in an accessible way. 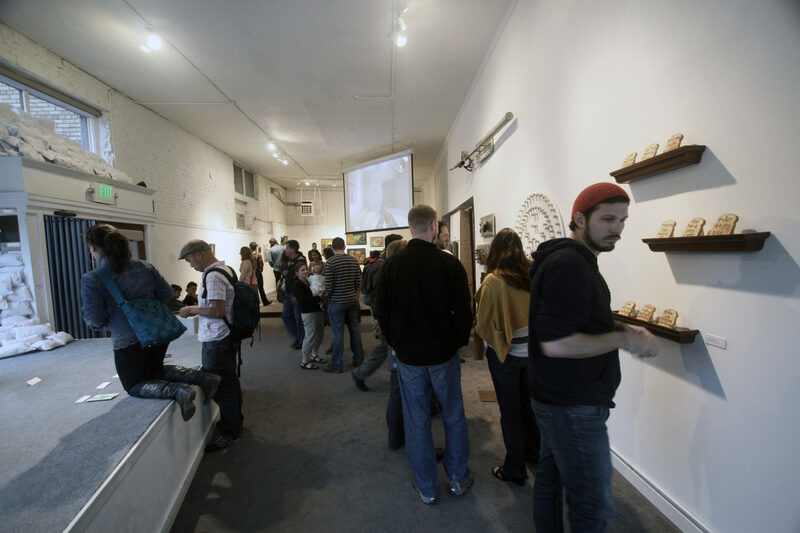 This was our first full-scale exhibition at our space in downtown Seattle, and we scheduled it to announce our priorities early on and set the tone for future shows. We accept submissions of things that are not for sale on an ongoing basis. When possible, we may mount another Not For Sale exhibition.